WSOE 5: Hearthstone – The Return of Jia will feature two days of competition. Day 1 will host a double-elimination tournament featuring our four returning challengers from WSOE 2: The Hearthstone Showdown. They will each submit 7 decklists from 7 different classes and go through a draft process (blind ban, blind pick, blind ban, blind pick, blind ban, pick from remaining 2 decks) at the beginning of each match to determine which 3 decks are used by each player. Each match is a best of 5 series, and the final match of the bracket will determine which challenger will move on to Day 2 and face Jia herself in the main event match for a chance to become the new WSOE Champion! This change will motivate our players to flex their deck-building skills a bit more than usual and give viewers something a little different to watch in anticipation of the coming Standard changes. Day 2 of the event will showcase a series of fight card match-ups with the competitors battling each other in stand-alone best of 5 series matches. The winner of each fight card match-up will earn $2,500. 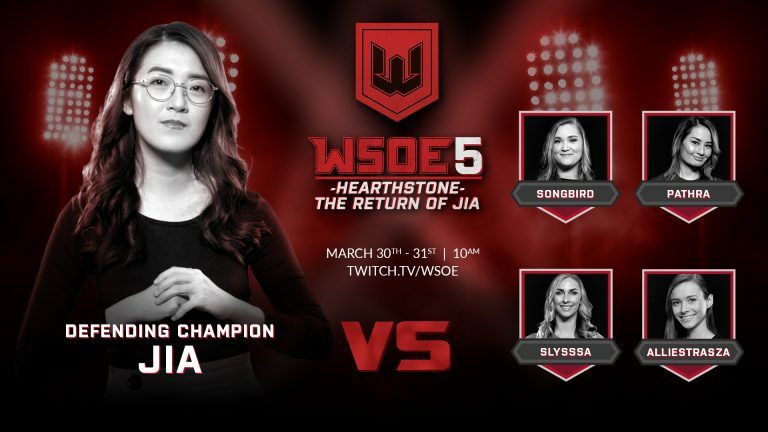 The main event of WSOE 5 will be the final best of 5 series of the night: our top challenger from the Day 1 double-elimination bracket vs. the reigning WSOE Hearthstone Champion Jia! The winner of this match will earn $15,000 and go down in history as our WSOE 5: Hearthstone – The Return of Jia Champion!